Fully biologically active when compared to standard. 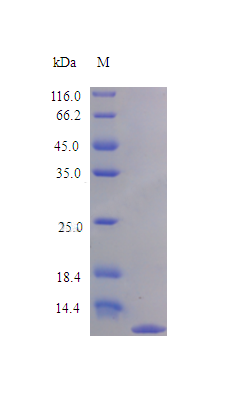 The biological activity determined by a chemoattract bioassay using human blood monocytes is in a concentration range of 10-100 ng/ml. Less than 1.0 EU/ug as determined by LAL method. Protein will be provided with aseptic processing and endotoxin removal. Generally, the shelf life of liquid form is 6 months at -20/-80 degree C. The shelf life of lyophilized form is 12 months at -20/-80 degree C.
Refer to the datasheet for activity details. For other activity applications, researchers should evaluate this protein for suitability in their model system. Small volumes of Ccl3 active protein vial(s) may occasionally become entrapped in the seal of the product vial during shipment and storage. If necessary, briefly centrifuge the vial on a tabletop centrifuge to dislodge any liquid in the container`s cap. Certain products may require to ship with dry ice and additional dry ice fee may apply. Monokine with inflammatory and chemokinetic properties. Has chemotactic activity for monocytes, neutrophils, eosinophils, basophils, and lymphocytes. Required for lung TNF-alpha production, neutrophil recruitment and subsequent lung injury and may function as an autocrine mediator for the macrophage production of TNF-alpha which in turn up-regulates vascular adhesion molecules required for neutrophil influx. This protein binds heparin. NCBI/Uniprot data below describe general gene information for Ccl3. It may not necessarily be applicable to this product. 1. Study shows that erythropoietin reduced chemokine CCL3 mRNA expression in rat cerebellar neuron-enriched preparations during neuroinflammation.